At the annual Firefighter Appreciation dinner held on February 23rd 2019, Carol Taylor was given the Sutphin-Brown award. Carol has been a member of the Fire Department since 1995. Carol was hired as EMS Chief in 2006 and was instrumental in getting the ambulances certified by the state in order for us to bill insurance. Carol retired effective 2/1/2019 and we wish her the best in her endeavors. On February 23rd, the Florence Township Fire Department held their 21st annual Firefighter/EMT Appreciation Dinner. At the dinner, several of the members received acknowledgment for the work they have performed in 2018 to the residents of Florence and surrounding communities. Below is a video that was made to highlight some of the events that occurred. This is just a small snippet of the work that we did in 2018. If this interests you and you would like to be a part of the team, you can call Brian Richardson at 609-499-6007. Election will be held on February 16th from 2:00 - 9:00 PM. There is one opening on the Board of Fire Commissioners that will be voted on along with the budget. 401 Firehouse Lane, Florence NJ 08518. Please come out and support your local Fire Department. If you like to see a copy of the 2019 Budget, please click here. It is with great pleasure that we have begun the construction of out 9/11 memorial in front of the firehouse. This is going to be a process to have this whole thing completed. We have placed the steel and now will be landscaping, running electric lines, and putting in paver's. Click here for pictures of the progress so far made on the memorial. It is with great pleasure that after a year and a half of diligent, and tedious teamwork Florence Township Fire Department and District will be accepting a piece of the World Trade Center Tower to display on our grounds. Our department was selected for this honor due to many variables and hard work. However, we would not have traded it for anything. We will be retrieving the artifact on Wednesday November 18th 2015 from JFK International Airport's special hanger and will be bringing the artifact home to the Florence Township Fire Company headquarters. At this time a specific time of arrival back in Florence is not available. We would like to thank the NJ/NY Port Authority and the Collections & Project Manager of the NY's Art Preservation Services for all their support with this acquisition. Further details will follow regarding the construction process of a memorial and it's progression as they occur. God Bless all of the victims who lost their lives on that horrific day, along with their families and friends who are still grieving. We would like to thank the community for your generous donations. Together with the members of the fire department we were able to make a nice donation to the Burlington County Sheriffs toy drive! The Florence Township Fire Department would like thank Chief Kevin P. Mullen for his over 31 years of service. Kevin started as a volunteer Firefighter in 1987. He held the office of LT and Captain thru the years on the volunteer side. Then in September 1999, Kevin was the second career firefighter hired and was the Fire Marshall and Business Administrator for the Fire District. In 2009 Kevin was promoted to Chief of the Department. We would like to wish Kevin and his family a happy retirement and wish him the best in his next endeavors. At the November 12th Fire Commissioners meeting Kenneth Cunningham was sworn in as a Career Firefighter. Kenneth was hired on 11/01/2018. He started with the Florence Fire Department in August 2001 as a volunteer firefighter. We wish Kenneth the best with his new career and look forward to working with him. The Florence Township Fire Department participated in the Veterans day celebration. We would like to thank all of those who served our country and paid the ultimate sacrifice. We would also like to thank those who are currently serving our country keeping all of us safe. On July 9th 2018 at the Board of Fire Commission meeting, David Motta was sworn in as a career firefighter. Dave has spent the last 10 years as a volunteer fire fighter with the department. We look forward to working with him to keep the residents of Florence Township and surrounding communities safe. Pictured is David being sworn in by mayor Craig Wilkie with his wife Caitlyn looking on. 9/11/18 marks the 17th year of the tragedy that struck the United States. We will never forget those who perished in the attack, especially those emergency workers (343 firefighters, 37 Port Authority of New York and New Jersey Police Department, 23 NYPD officers, 8 EMT's and paramedics form private emergency medical services, and 1 New York Fire Patrol) who rushed into the building to save as many as they could. We lost 412 rescue personal that day and still continue to lose them today. We would like to thank everyone who came out for the open house that made it a huge success! All of the firefighters and EMT's had a blast interacting with the public. If you would like to join the Fire Department you can Fire Marshal Brian Richardson at brichardson@ftfd40.org. Below are some of the pictures of the night. We are already planning next years!! At the Board of Fire Commissioners meeting held on October 8th 2018, Marc J. Stranko was sworn in as the first career fire lieutenant of the Florence Township Fire Department. Marc first join in 1994 as a volunteer and hired as a full time fire fighter in 2001. We wish best for Marc and look forward to working with him! Marc being sworn in as his son Tommy is holding the bible. On July 17th, the Florence Township Fire Department visited the day camp being held at the Riverfront School. FM Richardson gave the children fire safety tips while another group was touring ladder truck. Pictured below is Dave Motta giving a tour of Tower Ladder 4015. On May 5th the Florence Township Fire Department had a housing for our new Rescue Engine and Ambulance. These two new vehicles will help us with our jobs and help keep us safer doing our jobs. We would like to thank all the Florence residents for your support in purchasing the equipment and for all the support you give us through the year. 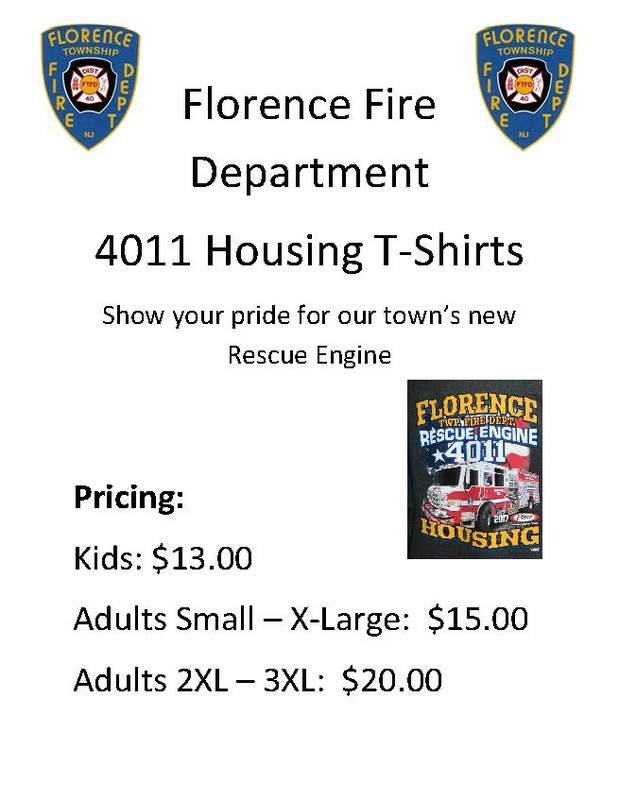 If you would like to purchase a shirt you may do so by stopping by the firehouse at 401 Firehouse Lane. Click here to see the flier with prices. Cash or check only please. At the fire commission meeting held on 3/12/2018, Bob Schoen and Jason Ryan were sworn in for 3 year terms as commissioners. We look forward to working with the new fire commissioners to continue to serve the residents of Florence Township and surrounding area. Jason Ryan being sworn in by Mayor Wilkie. The Florence Township Fire Department is proud to announce that William Blackwell (Billy) was selected as the Sutphin-Brown Award for the 2017 year. The Sutphin-Brown award is awarded every year to the firefighter who exemplifies extraordinary service to the department. Billy as been a fire fighter since 2006. He is extremely dependable and a very dedicated person. We are very fortunate to have Billy as a member of this department. Congratulations Billy!! We are all proud of you!! At the Board of Fire Commissioners meeting held on January 8th, the officers of the Florence Township Fire Department were sworn in for their terms. Below are the pictures of the individuals getting sworn in by Mayor Wilkie. We would like to thank everyone for their generous donations to make this another successful year! Look for us again around thanksgiving time for the toy drive for 2018. On November 11th, members of the Fire Department and community came out for the dedication of the 9/11 memorial. Members of the Fire Department secured the steel, designed and built the monument. You may stop by any time to view the memorial. It is located directly in front of the firehouse. We ask if you do come view it, that you park in the administration side of the firehouse. That would be the second driveway. Below are a few of the pictures of the dedication. We would like to thank everyone who came out to the Halloween Party that was held at the firehouse on October 30th. We hope that all the kids had fun! Below you will find some pictures of the day. Hope to see you again next year!! At the 2016 District Election the voters approved for the fire district to purchase a new ambulance. This new ambulance will serve the residents of Florence Township and its neighboring towns for approximately the next 10 years. Below you will find pictures of the ambulance as it's being built. At the Fire Commission meeting held on September 11th 2017, the Florence Township Fire Department swore in Firefighter Thomas Marabillas as a career firefighter. Thomas joined the fire department in 2010 and completed his fire training the same year. We would like to welcome Thomas a board and wish him the best. 9/11/17 marks the 16th year of the tragedy that struck the United States. We will never forget those who perished in the attack, especially those emergency workers (343 firefighters, 37 Port Authority of New York and New Jersey Police Department, 23 NYPD officers, 8 EMT's and paramedics form private emergency medical services, and 1 New York Fire Patrol) who rushed into the building to save as many as they could. We lost 412 rescue personal that day and still continue to lose them today. The Florence Township Fire Department would like to take this time to wish the class of 2017 good luck on graduating from the Florence Township Memorial High School. We would like to take this time to congratulate Robert Lung on graduation. He joined the department in April of 2016 and in the year plus, he has attained his Fire Fighter 1 certification and also his EMT. He is also one of the top responders in the department. Good luck to Robert and all his classmates!! At the Board of Fire Commissioners meeting held on 4/10/2017, Gary Richardson was sworn in as Safety Officer and Albert A Jacoby was sworn in as Assistant Safety Officer. We would like to congratulate them on their new positions and look forward to working with them. On Saturday Feb 25th 2017, the Florence Township Fire Department held their annual Firefighter Appreciation Dinner. At the dinner, George Yurcho was named the Alfred Brown - Chester Sutphin Firefighter of the Year Award. George joined the department in 1985 as a junior firefighter and has served the department in many area's. Through the years, George has been lieutenant, captain, and Chief of the department. He has also been president and currently serving as the Financial Secretary of the Fire Company. Congratulations George!!! If you would like to view the annual slide show, click here. We would like to thank you for your continued support of the Fire Department. The Florence Township Fire Department would like to thank everyone for their generosity! Each year the program keeps getting bigger and bigger. So let this inspire us to may it even bigger next year!! You always hear about how firefighters have this brotherhood about them, but can't really explain it. Below may give a glimpse into what brotherhood really is. Firefighter/EMT Eric Fyler and Firefighter Matt Taylor were on shift and came across a post on Instagram from a firefighter/emt in Florida. Select the link below to read the story or pick the link for the video. At the Board of Fire Commissioners meeting held on June 13th, Carolyn Taylor was sworn in as EMS Chief of the Florence Township Fire Department. We wish Carolyn the best and look forward to working with her. On June 15 2016, Andrew Leach graduated from Florence Township Memorial High School with honors. Andrew has decided to enlist in the Navy and will leave in July 2016. We will miss Andrew while he is gone but are very proud of him for what he has accomplished so far. Andrew came to the Florence Township Fire Department in December of 2012 as a 15 year old and was part of the explorer program. He went to fire school as a junior firefighter and graduated from fire school in 2014. He became a fully qualified fire fighter in October of 2015 as that is when he turned 18. Since he has joined the fire department, he has responded on 459 fire calls and has amassed 296 hours of training. We here at the fire department wish him the best in his endeavors. At the April 11th 2016, Board of Fire Commissioners meeting, FF/EMT Eric Fyler was sworn in as a career FF/EMT. At the May 9th 2016 Board of Fire Commissioners meeting, FF/EMT Mike Warren was sworn in as a career FF/EMT. We would like to welcome both Eric and Mike to the Florence Township Fire Department family. We are looking forward to working both of them and wish them the best in their career. Congratulations to Marvin Wainwright for being selected as the 2015 Alfred Brown – Chester Sutphin Award recipient. This award is given to the Fire Department’s Member of the Year and is awarded at the annual dinner. Marvin has been a member since 1989 and has held various positions within the company including President, Vice-President, Lieutenant, Trustee, and currently as Secretary. He also served on the Board of Fire Commissioners when the Department consolidated from three fire companies into one. Marvin continues his dedication as an active firefighter being a top responder in the Department. We would like to thank him for all of his years of service and congratulate him on this award. Three candidates put to run for one seat on the fire commission. John Fratinardo received 201 votes, Barbara Fazekas Mayer received 115 votes, and Jason Ryan received 27 votes. The budget passed with 212 yes, and 116 no. The Fire District asked the voters to approve a capital question to replace the two aging ambulance we currently have. One would be bought in 2017 and the second would be bought in 2019. That question passed 245 yes, to 82 no. On Friday October 9th the Florence Township Fire Department held their open house. Just as the open house started, luck would have it start to rain heavily. We would like to thank all that came out in the rain to make this a successful event. We hope that the kids enjoyed themselves and hopefully we have inspired even one to becoming a firefighter in the future. Mom and dad's are welcome also! On Sunday, October 11th, Florence Township Fire Department’s emergency vehicles were blessed at Saints Stephen and Barnabas Episcopal Church’s annual Service of Appreciation for Police, Firefighters, and EMT’s. The full event included: a church service dedicated to police officers, firefighters, and EMT’s; the blessing of the department’s engine and ambulance; and a delicious brunch. The FTFD would like to thank Saints Stephen and Barnabas for their blessing and continuous support within the community! These cuddly bears were donated through the Florence Township Education Association PRIDE in Education grant and matching funds from the Florence Township Fire Company and Florence FOP Lodge #210. The bears will be used on emergency calls involving children because there's something about a teddy bear that's impossible to explain. When you hold one in your arms, you get a feeling of love, comfort and security. The Florence Township Fire Department would like to congratulate Charlie LeVach, Rachel Klenk and Shayne Krywy on receiving the Richard Yurcisin/Florence Township Emergency Services Award; each received a $500 scholarship, funded by the proceeds of the Florence Township Emergency Services Golf Outing. Congratulations to the Florence Township public workers on winning the 2015 mayors cup. The township public workers beat the Fire Department in game one. Game two, the Florence Police beat the teachers. In the championship game, the township workers took the police into extra innings to win their second Mayors Cup. Congratulations to FF/EMT Ken Cunningham and FF Matt Taylor. They graduated June 23 from the Structural Firefighting – Strategy and Tactics class. Fire Department Chaplain Gary Richardson also performed the invocation and benediction at Graduation. The Florence Township Fire Department regrets to announce the passing of Gene Wolfe Sr. Gene was a Life Member, Department Chief and Captain of the Florence Emergency Squad. Services will be held at the Dennison Funeral Home in Florence on Tuesday, April 28 from 6p to 9p. The funeral will be held on Wednesday, April 29 at 1pm. The Florence Township Fire Department held their annual Halloween party on Sunday Oct 25th. We hope all the kids enjoyed themselves and wish all of them a safe and happy Halloween! Let’s never forget those that perished that day, 14 years ago today. Many people went to work that day, oblivious to the horror that awaited us as a nation. Many of us can recall where or what we were doing at the time of the attacks. New York’s bravest also went to work that day, saying goodbye as they left their houses, families, loved ones. Not knowing that they would never return. We have all heard of the stories of how off duty firefighters came back, firefighters running to the scene due to the trucks unable to get through the traffic. All of them ran into the building to help get others out and to put the fire out. Every one of them is a hero! The members of the Golf Committee would like to thank everyone involved in making our 21st Annual Golf Outing such a success. Special thanks to all our workers, golfers and sponsors, especially Killarney's Publick House, Fountain of Life, Lucas Chevrolet and BELFOR Property Restoration. The Class of 2016 will again receive $1,000 in scholarships thanks to your generosity. Save the date for next year -- August 20th 2016. Kevin Stokely from BELFOR presented three plaques that currently reside in Florence FOP Lodge #210 (Firemen's Hall) after being restored to their original state. These plaques were damaged during the fire at the Lodge on July 12th 2015. Congratulations to Albert A. Jacoby for being selected as the 2014 Alfred Brown – Chester Sutphin Award recipient. The Alfred Brown – Chester Sutphin Award is given to the Fire Department’s Member of the Year. Albert has been an active member of the Department for 50 years, 34 of those years serving as Treasurer. He currently serves as President of the Florence Township Firemen’s Relief and Exempt Associations. In 2014, Al was the Top Responder in the Department and was recognized as part of a unit citation. He is always helping with projects around the firehouse. Last week Officer Semus of the Chesterfield Police Department suffered from a serious medical emergency and remains in critical condition. He is also a past lieutenant from Mansfield Fire Department Station 331. Please keep Officer Semus and his family in your thoughts and prayers. The Florence Township Fire Department regrets to announce passing of Chief James “Libby” Liberatore of the Burlington Township Fire Department. Libby was very involved in the fire service. He also served as a Fire Coordinator for Burlington County, a state Judge in the New Jersey State Fire Chiefs Judging Association, and countless other organizations. He was a great friend and mentor to many in the fire service. He will be sadly missed. RIP brother!! The Florence Township Fire Commission held their annual reorganization meeting on March 9th. At the meeting, new fire commissioners were sworn in. Robert Shoen and Bill Berry were each sworn into a 3 year term by Mayor Craig Wilkie. We would like to wish the best of luck to both Bill and Robert and look forward to working with them. Adam Shoen was sworn in as career firefighter/emt with the Florence Township Fire Department. Adam joined the fire department in 2006 as a Fire Explorer and has continued to advance his training. We welcome Adam aboard and are excited he has joined took the job!! Matt Talyor and Briana Padua were sworn in as firefighters. Matt joined the fire department in 2011 as a fire explorer and kept taking training. Briana joined the department in 2012 and took training to become a firefighter. Commissioner Barb Mayer gives ex-commissioner Scott Arnold a little token of appreciation for serving the past 3 years as a fire commissioner. Scott thanked everyone for the opportunity to serve and thanked everyone who supported him. Chief William Hartman from the Bordentown Township Fire District #2 recently announced that he would be retiring. Chief Hartman will be sadly missed and we thank him for his many years of service. We wish him and his wife the best in retirement!! We would like to thank everyone who braved the elements and came out and supported us. Chief Kevin P. Mullen getting sworn in with his family looking on. Chief Mullen bring congratulated by Mayor Craig Wilkie. On January 12th at the Board of Fire Commissioners Meeting, the line officers for 2015 were sworn into their offices by Mayor Craig Wilkie. On Saturday Oct 4th the Florence Township Fire Department flew the flag from our tower in honor of the last piece of steel from the World Trade Center towers as it made its trek to its final resting spot at the National Marine Corps Museum in Washington DC. Tower Ladder 4015 flew the flag from the overpass of New Jersey Turnpike at Columbus Road. On December 10, 2014, FF/EMT Paul Wright graduated from the Gloucester County Police Academy after 19 weeks of physical, academic and hands on training. He will be serving the Florence Township Police Department in the patrol division. Paul began serving his community at age 14 when he joined the Florence Township Fire Department as an Explorer with several friends. He continues to be an active member of the fire department. Ptl. Wright will surely be an asset to the police department just as he is an asset to the fire department. He received several accommodations during his career including an honor/valor award in 2011 from the Burlington County Fire Advisory Board for his actions at a serious motor vehicle accident on the New Jersey Turnpike where he placed himself inside of an overturned tractor trailer caring a flammable liquid that was leaking in order to render aid and remove the driver who was trapped. We wish Paul a successful and safe career with the Florence Township Police Department. The Florence Township Fire Department would like to thank everyone for coming out to the open house this year and making it a success! We had a lot of fun again this year even though the weather wasn’t so nice. We are happy to have so many people come and bring their children. We strive every year to get more and more people to come. Remember to check your smoke and carbon monoxide detectors. If you need assistance or have questions, please feel free to call 609-499-6007. On July 15-17, 2014 four members traveled to Baltimore Maryland to attend the Firehouse Expo. The Firehouse Expo is an annual conference. While there, they had the opportunity to attend the Live Fire Engine Company hands on training where we participated in evolutions of automobile fires, two floor structure fire response with a limited crew, thermal imaging/search and flashover training and simulator. During the classroom sessions, they attended classes that detailed the topics or Flow Path Management (tactical ventilation), 30 ways to be jump seat ready (preparation in regards to personal equipment and positive fire ground attitude were the main focus) and Investigating the smell of smoke. They also attended the Opening ceremonies where the Heroism awards were presented to three Firefighters from Bryan Texas for their efforts to rescue a Lieutenant who was trapped in a commercial building fire. The keynote speaker was Dr. David Griffith of the Charleston, SC Fire Department. Now Captain Griffith, was the driver of the first due engine to the Sofa Super Store fire on June 18, 2007 where 9 firefighters died in the line of duty. Dr. Griffith gave an inspiring talk about his transition from resisting and resenting organizational change to a positive attitude embracing change in the fire service to ensure that this tragedy does not repeat itself. During the Expo, they were able to see the most current equipment available and speak to the various venders. We spent a fair amount of time speaking to SCBA manufacturers learning about the new standards and significant changes related to SCBA. While there, one member was lucky enough to win a training package from Digital Combustion worth $945.00. The package includes software that allows images taken of buildings in our response area that can be down loaded and automated graphics of smoke, fire and explosions can be added. Using this training program allows firefighters and officers to practice decision making skills in a virtual environment. Thank you to the members of the department and Board of Fire Commissioners who support this and other training opportunities as the residents are the ultimate beneficiaries of the knowledge and abilities of our department. In 1995, the Roebling Volunteer Fire Company #3 began a very successful community golf outing. In 2006, the Florence Township Fire Company #1 and Florence Township Police Officers Association (F.O.P. Lodge #210) combined to continue the tradition. Each year over 150 people support and enjoy the tournament. Through the generosity of golfers and sponsors, we were able to establish the Richard Yurcisin Florence Township Emergency Services Award. This $500 award is given each year to two graduates of Florence Township Memorial High School who will continue their education in some type of community service profession. This year, the golf outing is scheduled for August 16th at Hanover Golf Club with a new starting time of 12:00 pm. greatly assist us to continue the scholarship program. "THANK YOU" for your support over the past years. With your help, we are looking forward to making our 20th year the best one yet! On July 12th Florence Township held their annual patriotic day parade. One of our members, Gary Richardson, was gracious enough to take pictures of the parade as it was passing by his house. We would like to thank Gary for sharing these with us. If you would like to view them, click here. The Florence Township Fire Department would like to congratulate Brianna Padua, Matt Taylor, and Andrew Leach on passing the Firefighter I exam and becoming certified firefighters in the state of NJ. Our thought and prayers are with the Union Beach Fire Department who had a line of duty death Sunday, June 8th 2014. Please keep the brothers of Union Beach Fire Department and the family of fire fighter Robert Myer in your thoughts. On May 15, 2014 member Keith Fisher was recognized at the 2014 PROCOPS annual award dinner. FF Fisher was recognized for his life saving efforts in 2013. While on his way home from work, he observed a serious motor vehicle accident on High Street in Burlington City where a vehicle had struck and entered a building. FF Fisher along with another civilian entered the building and saw that the driver was unconscious and not breathing. Fisher and the civilian began to remove the driver when a police officer arrived. They were able to remove the driver from the vehicle and building. While the police officer was performing CPR on the driver, Fisher and his partner re-entered the building and began assessing and treating the passenger. The selfless and quick actions by Fisher and others involved were recognized by the Burlington City Police Department and Burlington County Prosecutors Office. FF Fisher was very active with the Florence Township Fire Department for many years prior to moving, when he became active with the Westampton Twp. Emergency Services. Congratulations to Keith and all of the recipients of the 2014 PROCOPS awards. We would like to congratulate the Florence Township employees for winning the 2014 Mayors Cup. The Florence Township employees defeated the Florence Township teachers for the trophy. In the first game of the day, the teachers defeated the police. In the second game, the township defeated the Fire Department. Click here for more photographs of the day. Last night at the Florence Township Board of Fire Commissioners meeting Darnell Taylor was honored for his heroic efforts in saving 4 people from the Delaware River on April 15th 2014. Darnell risked his life for others. For this, Darnell received the Civilian Medal of Honor. We are grateful to have such a great person like Darnell living in this community. The Florence Township Fire Department participated in the Relay for Live held at the Florence Township Memorial High School over the weekend. The event raised over $58,000 in the fight against cancer!!! We would like to thank the organizers Barb Fazekas Mayer, Carey Kessler-Trayner, and James Ford for a job well done! We would also like to thank Majestic Fire Apparel for their help in supplying us the purple hoods in time for this event. We hope to see all of you again next year!! !